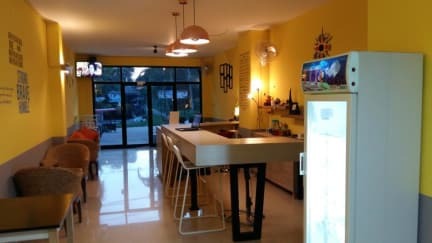 If what you're looking for is a conveniently located hotsel in Koh Lanta, look no further than M Hostel. It is located only 5-minute walking distance from the famous beach of Koh Lanta. Besides, it is in a center area and surround by all the facilities such as minimart, local restaurants, laundry, post office and ATM. M Hostel offers a choice of comfortable dormitories with 3 story building and small garden common area. Guest can find a counter bar, safety lockers and a shared lounge with kitchen area. Laundry services are available and there are shops located nearby the hostel. In M Hostel, guests can contact the tour desk for local information. We offer every day to our guest unlimited internet WiFi , coffee, drinks, and cold water. 1. Check in from 14.00pm and check out until 11.30am. 2. Cash (THB) payment only upon arrival. (1) Notification of cancellation or amendment booking should be in the form of letter or fax received by us at least 7 days in advance prior to the arrival date. Otherwise, 1 Night of booking rental will be charged. (2) In case of No-Show or Early Check-out, full amount of booking will be charged and non-refundable. (1) Low season 1 May - 31 October, reception open time 07.00am - 20.00 pm. (2) High season period 1 November - 30 April, reception open time 07.00 am - 22.00 pm.